backpacker indonesia : Ketep Pass near attractions, there are natural attractions not least she exclaimed. His name Kedung Kayang Waterfall, dear presence attractions are still a few people who know about it because not optimally managed. Kayang Waterfall situated in Village Wonolelo, Sawangan District, Magelang District. But some people consider this waterfall entrance area Boyolali. Fair enough because of its location directly adjacent to the Boyolali. Entering the area attractions are just a simple gate, and many people think it is the road to the township. Gate attractions are included on a nearby street and there turn lane to the location of camping grounds. As far as 100 meters down the road and parked the vehicle, we can not necessarily see the beautiful waterfall from a distance. We had to walk as far as 200 meters into the cliff to see waterfalls Kedung Kayang scenery from above. Kayang Kedung Waterfall is one of the places through which the Borobudur Tour Line-Selo-Solo (SBB). Which has a waterfall about 30 meters high is still natural and not spelled out on a large-scale exploitation. To go to the bottom of the waterfall, we have to travel as far as 1km rotate through rice fields and watersheds. On the way we found a cave with a small size of Japan and a half meters high. The visitors could only see the mouth of the cave because the cave is very difficult to enter the cave that is therein was mostly mud and very narrow. Travel down the cliff we go through with the down hundreds of stairs that later turned into a dirt road. This dirt road is barely passable with decreasing field, slippery, and we must be good at choosing the road impassable. 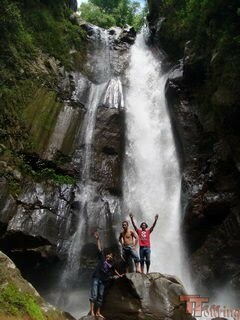 A tiring journey to reach the bottom of the waterfall with natural beauty paid emitted by this waterfall. The sound of the swift water that falls from a height seemed to make sense of peace accompanied by the sound of chirping birds numerous in the surrounding area.